As a person who had both project and cost center budgeting responsibilities for many years, I must admit this was an effort that I did not necessarily enjoy and usually procrastinated (much like those of us that procrastinate filing our taxes). Ironically, now that I am on the other side of the fence as a consultant, I work very hard to establish the credibility and trust of my client that is required to be assigned responsibility for the project budget. Best practices associated with the project budget are focused on efficiently leveraging the planning assets created to that point in the process, and performing the appropriate level of analysis to develop a project budget that will be understood and approved by the client, and just as importantly can be managed throughout the project life cycle. Therefore, the best practices shared in this column represent areas that should be considered during the project budgeting process, not a step by step instruction on creating and maintaining a project budget. Within the world of IT projects, labor generally represents the largest and most complex component of the overall project budget. The important concept associated with the labor budget is to ensure that other planning artifacts are utilized to efficiently create the labor budget. This approach significantly streamlines the development of the labor budget, and most importantly it ensures that the project budget is defensible when compared to the project schedule and resource / staffing plan. Grouping of resources – Understanding of costs by type of resource helps articulate the key cost drivers within the labor budget. Breakdown between internal and external costs – Clients generally place more emphasis on external costs, because these costs are incremental to their business (these costs would not be incurred if the project was not completed). Timing of costs – It is important to summarize the costs by time period, because timing of project costs will be required for financial budgeting and reporting purposes. The following represent the other areas to consider when completing the development of the project budget. These areas are discussed with your client to understand the appropriate approach, based upon the client’s environment and organizational assets (e.g. financial reporting policies, procedures and tools). Non-labor costs – Non-labor costs generally relate to planned purchases required to support the project. There are capabilities to capture these costs within the project schedule, but it usually adds limited value to reflect them in the project schedule. It is a best to plan and track these costs directly within the Project Budget Tracking tool. Capitalized costs – Companies capitalize certain costs associated with developing or purchasing software designated for internal use. It is important to understand your clients business rules associated with capitalization, and ensure that the project budget supports both planning and tracking capital versus expense project costs. Operational Costs – Although it is not part of the project budget, it is important to provide visibility of the impact of the project on the cost of the on-going operations. The costs included in the project budget can be utilized to derive many of the cost impacts on the on-going operations, such as: depreciation, customer support, infrastructure maintenance and software maintenance. The project manager normally has limited responsibility for project funding decisions, however he/she must reconcile the funding model to the project budget. It is important to understand that when the project budget is approved by the project sponsor, the project cannot be launched until it is fully funded. 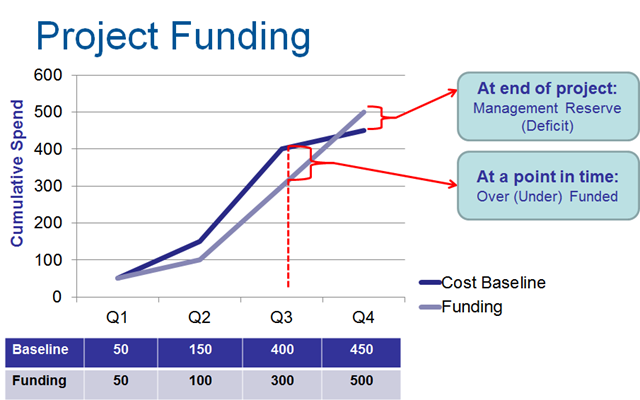 Fully funded refers to the fact that the project is accounted for in both department cost center budgets (expense) and the capital plans (capital). Another critical aspect of the funding model is not only comparing the total project budget to the total amount funded, but also understanding the timing of the project funding vs. the budget. Under funded situations at any point in time require action prior to executing on the project as planned (e.g., may require delays in launching specific project activities / phases). The following provides an illustration of the components of the project budget, from the lowest level activity estimates in the project schedule up to the project funding model for the project.